Planning a wedding takes lots of time, effort and, let’s be honest, guts. It’s also a great experience and opportunity for both the bride and the groom to express their personalities. If you and your partner have a little country flare, here is a western wedding guide for you. Western doesn’t mean that you have to have a hoedown. You can have a classy, graceful wedding with small western details to show off your style. This guide includes what to look for in every aspect of planning a western wedding, including invitations, flowers, western wedding attire, the venue, and more. Have your wedding party reflect your western theme with western wedding attire. There are amazing selections for the bride, groom, bridesmaids and groomsmen. This is what it’s all about. The bride! She’s the most important part of a wedding. The bride should go with a western themed wedding dress that makes her feel confident, comfortable and gorgeous. Dresses with a more romantic and vintage feel are great for western weddings, and you can never go wrong with ivory and lace. The bride’s look doesn’t just include the dress, but also the perfect pair of high end western boots to wear with it. We are a huge fan of of cowboy boots with splashes of color. There are now more exciting boot options than ever before. Some of our favorite wedding boots for 2018. Jeni Lace Boots by Lane, Almost Famous Boots by Double D Ranch, and Robin Boots by Lane. We also recommend getting matching cowboy boots for the bride and groom. At Pinto Ranch, we can special order boots from Lucchese, Stallion, Rios of Mercedes, or Rocketbuster with unique leather inlays or initials to add more personalization for your wedding day. Just make sure to place an order at least 6 months in advance. Please contact us for more information on special ordering a unique pair of western boots. See our full selection of women’s cowboy boots to find the pair that reflects your western style and personality. Bride images courtesy of Buckskin Bride and Style Me Pretty. Bridesmaids should wear a dress in coordination with the wedding colors. Short or tea length dresses are great for a more casual feel for the wedding party, while a long dress is considered more formal attire. We suggest each bridesmaid have her own pair of cowgirl boots and a piece of western jewelry to complete her look. The groom can look the part with or without a cowboy hat. The iconic western style works for the true cowboy, but the groom doesn’t have to wear a hat to have western flair. Go with a western sport coat with a nice pair of jeans and cowboy boots. We recommend one of our unique microfiber sport coats that look identical to leather but are lightweight for the warmer months and perfect for outdoor weddings. Choose a premium dress shirt from our Pinto Ranch YY Collection to go underneath the western jacket. Complete the look with a pair of sterling silver, western-style cufflinks and a buckle or buckle set. Your handsome groom will look classy, without going overboard on the western theme. Bolo ties bring out the elegance of western attire by adding a rugged, refined accent to a suit And they’re definitely western! Replace your bow tie for a bolo this year and embrace the western chic. If you’ve never worn a bolo tie, we’ve got you covered. We have a whole blog dedicated to how to wear them. Don’t be a afraid to let the groomsmen have a little bit of fun with their western look. Try these bolo ties or a western leather vest for a more traditional western look, or these fun western ties for a more playful outfit. If your western wedding is more casual, the groomsmen can also simply wear jeans and a blazer. But we all know the decision is ultimately up to the bride. Groom images courtesy of Intimate Weddings, Style Me Pretty and Wedding Wire. Also consider the font selection for the invitations. Stay away from serif fonts with a high contrast in weight variation. Instead, choose more romantic script fonts, playful sans serifs, and serif fonts with little contrast in weight variation. Invitation images courtesy of Style Me Pretty and Elegant Wedding Invites. Because western weddings are typically held outdoors, it’s best to do a western-themed wedding in the spring, summer or early fall before the weather gets too cold. The colors you choose for a wedding also contribute to the overall feel. Most western or country weddings are heavily influenced by nature, so consider choosing a color palette with earthy tones contrasted with a brighter hue. With that being said, consider the season of the wedding when selecting colorsarker hues are better for fall and winter, while brighter ones are best for spring and summer. If you are having trouble deciding what colors to choose, try using a wedding color chooser like this one from Wedding Wire. When preparing flowers for the wedding, consider wrapping the bouquets and boutonnieres with twine or burlap. Or add pheasant feathers for another nature-inspired touch. The delicate aesthetic of the flowers paired with natural textures is 100% country chic. 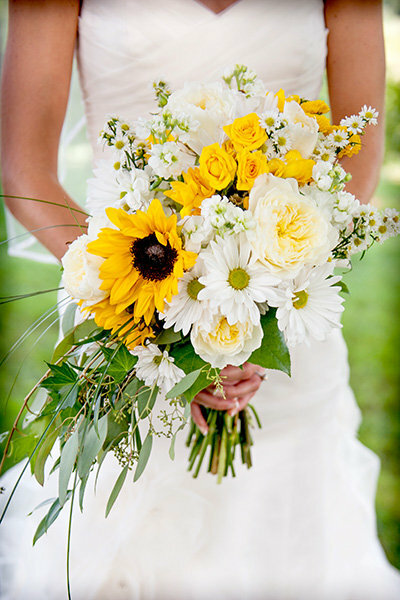 Floral images courtesy of Style Me Pretty, Buckskin Bride and Bridal Guide. The location, menu and decor set the tone for your western wedding. Wow guests with just the right rustic touches in a beautiful setting. When planning a western wedding, it is a no-brainer to go with a barn, lodge or outdoor venue. A rustic location set in the country creates a unique and unforgettable atmosphere for your guests. Keep in mind how hot or cold it will be on the wedding day when choosing to go with an outdoor venue. For hot summer days, an area with shade or other coverings will help keep guests cool. Venue images courtesy of Bridal Guide and Rustic Wedding Chic. A western wedding is the perfect place to serve BBQ, although it doesn't have to be the only option. When setting the menu for your guests, consider other types of cuisine like Southern-style fried chicken and biscuits with fresh greens or go South of the border with fajitas and margaritas. Decor images courtesy of Elegant Wedding Invites and Style Me Pretty. Regardless of whether you choose a barn or an open field for the reception venue, it’s important to create the mood with western lighting and rustic decor. Use candles, torches, or even lanterns to create a romantic atmosphere that is almost like being at a campfire. Consider placing candles or other open flames inside glassware like mason jars for safety reasons. Centerpieces should be inspired by nature. We recommend using tree stumps as the base of a centerpiece. Decorate the trunks with your favorite flowers, photos of the bride and groom or candles. If your venue has a lot of open space, consider bringing wooden furniture to fill up space and create focal points. Set up a couch with some chairs and add some old barrels to create a cozy, western space for the bride and groom to sit when they have a chance. We also love the idea of including a chalkboard with messages to your guests including where to sit, what type of food is being served, insights about the couple, etc. Check out our Chic Western Weddings 101 Guide for an easy way to save, share or pin all of the fun western wedding tidbits from this post. Congratulations on your big day!